Introduction: The hypertrophy adenotonsillar figure as one of the most important causes of pulmonary hypertension in infancy, but there are few records in literature possibly had too little inquiry and the remission after the adenotonsillectomy. Literature Review: The obstruction of the superior airways in the childhood turns from several causes, among them the commonest is the adenotonsillar hypertrophy (1, 2). This chronic obstruction frequently is associated by syndrome of the apnea of the sleep and, in the most serious cases, they evolve with pulmonary high blood pressure (3). The pulmonary high blood pressure is an indisputable indication for realization of adenotonsillectomy (4). Objective: To describe a case of pulmonary hypertension secondary of the adenotonsillar hypertrophy in clinic of ENT of a university hospital. Case Relate: M.E.O., 02 years and 06 months, he presented relating respiratory difficulty, coughing, nocturnal snores and wheezing in chest during day and night. A pneumonia was found with cardiomegaly. The Doppler echocardiogram study showed pulmonary arterial hypertension. The lateral X ray films showed important adenoid hypertrophy. Adenotonsillectomy was carried without problems. After seven months, the patient did a new Doppler echocardiogram that showed normal, showing clear reversion of all alterations shown in the first echocardiogram. Final Comments: Patients with adenotonsillar hypertrophy and chronic upper airway obstruction, present exuberant syntomatology, evaluated a pulmonary hypertension, especially during first infancy. The Doppler echocardiogram is safest exam and little invasive for determination of the diagnosis and the adenotonsillectomy is the definitive treatment. The adenotonsillar hypertrophy represents one of the main causes of pulmonary hypertension and Cor Pulmonale in infants, but there are few cases reported in the literature, possibly due to the lack of investigation and the relief of symptoms after the adenotonsillectomy. This study describes a case assisted in the Otorhinolaryngology service at a University Hospital aiming to make a profound study on secondary pulmonary hypertension and adenotonsillar hypertrophy. Upper airways obstruction in infants might result from different causes, such as caniofacial disorder, subglottic stenosis (a narrowing of the subglottic airway), choanal atresia and more commonly adenotonsillar hypertrophy (1,2). Chronic obstruction of the upper airways is usually associated with sleep apnea syndrome and, in more severe cases, develops pulmonary hypertension and Cor Pulmonale. Pulmonary hypertension development is based on hypoxic pulmonary vasoconstriction during apnea when sleeping. With the development of apnea accesses, pulmonary vascular resistance tends to grow resulting right heart failure (3). Wilkinson et al, when studying 92 children submitted to regular adenotonsillectomy, reported that 3% of them, through echocardiogram test, presented signs of right heart involvement with no clinical signs to anamnesis(3). Adenoidectomy is an unquestionable approach under pulmonary hypertension and Cor Pulmonale suspicion. After such process, it is possible to achieve quick normal clinical condition and echocardiography(4). Doppler echocardiogram is a fair method to diagnose pulmonary hypertension in patients with adenotonsillar hypertrophy who suffer from sleep apnea (5,6). M. E. O., a 2 yr and 6 months old patient, was taken to hospital presenting breathing failure. 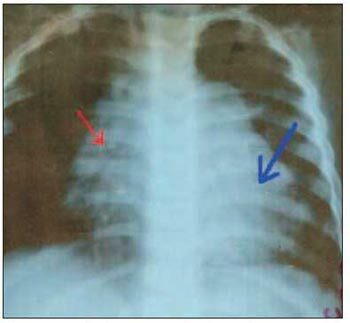 The child was pneumonia diagnosed and it was also found an enlargement of heart area through thorax X-ray (Picture 1). Patient was kept in hospital in order to have this enlarged heart problem analyzed. Patient´s mother reported breathing failure since the child was born, which worsened at 9 months of age. It had been followed by cough, snoring, and wheezing in the chest during night and day, besides the fact that the child could only sleep when sitting. When in hospital, an electrocardiogram (ECG) was performed presenting sinus rhythm (normal beating of the heart), 150 heartbeats per minute, right axis deviation and right atrium and ventricular overload. Doppler echocardiogram revealed hypokinetic right ventricle, enlarged right chambers of important degree, tricuspid valve with failure on coaptation of its leaflets, pulmonary valve with failure on coaptation of its leaflets, important dilatation of pulmonary stem and branches, holosystolic and holodiastolic tricuspid refluxes of moderate degree, and an 89mmHg pulmonary artery pressure estimation, what concluded to be pulmonary hypertension dysfunction. ENT evaluation was performed and that revealed palatine tonsil hypertrophy 3+/4+. 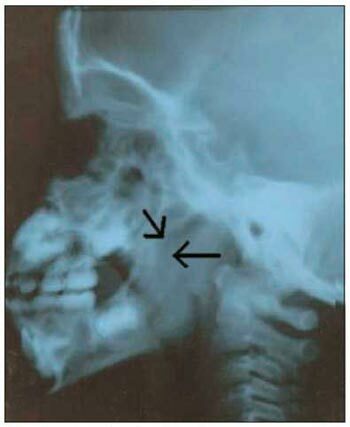 Cavum X-ray showed adenoid hypertrophy, hiding the rhinopharynx completely (Picture 2). Adenotonsillectomy was suggested besides all preoperative exams, which revealed being in normal conditions. Picture 2 - Important adenotonsillar hypertrophy (arrow) to cavum X-ray. Adenotonsillectomy was performed through dissection technique. There were no intercurrences and patient was released from hospital 4 days later. Seven months afterwards, patient underwent a new Doppler echocardiogram presenting normal activity of the left and right ventricle; tricuspid and pulmonary valves with normal opening, thickness and movability and pulmonary artery and branches with normal caliber. This revealed a normal result exam under anatomic aspect, what assured reversal of all alterations from the first echocardiogram. Although adenotonsillar hypertrophy is very common, secondary pulmonary hypertension to it has been hardly diagnosed due to lack of investigation and to the great amount of adenotonsillectomy approach performed in the past(4). The symptoms caused by adenotonsillar hypertrophy can be palatine tonsil infection, nasal obstruction; mouth breathing, snoring and, in more severe cases, sleep apnea, irritability, low development at school and daily sleepiness(5). Complications of such obstruction cover from alterations on craniofacial development to pulmonary hypertension and Cor Pulmonale (1,3,4). The current case already presented pulmonary involvement seen in the clinical history, assured by initial complaints. Adenotonsillar hypertrophy is the main cause of pulmonary hypertension during first childhood (6), which meets current patient's age. It is during this age that an enlargement of lymphoid tissues and a narrowing of cavum occur. Some authors make use of ECG exam to study the diagnosis for pulmonary hypertension in infants with adenotonsillar hypertrophy associated to sleep apnea. Nevertheless, such exam revealed low sensitivity (3,5). According to Sebusiani, Doppler echocardiogram is highly useful when diagnosing pulmonaryhypertension in infants with adenotonsillar hypertrophy, as it is considered a very safe, practical and non-invasive exam(5). That exam was very important when diagnosing right heart involvement of the current patient. Chronic obstruction of the upper airways followed by pulmonary hypertension and Cor Pulmonale is an unquestionable sign of adenotonsillectomy, once it is already known that clinical and ecocardiographic findings are fully reversible by surgery(3,6). The current child was clinically benefited by adenotonsillectomy and few months later there was Doppler echocardiography in normal condition. Patients with pulmonary hypertension associated to adenotonsillar hypertrophy submitted to adenotonsillectomy present preventive intra and post-anesthesia complications. For this reason it is important to diagnose pulmonary hypertension even with no clinical signs (1). After being diagnosed of pulmonary hypertension, patient was submitted to heart and preoperative anesthesia evaluations besides being under ICU care after surgery procedure. Adenotonsillar hypertrophy is a significant cause of pulmonary hypertension in infants. Echocardiogram is the best exam to diagnose pulmonary hypertension for being safe and non-invasive. We suggest this exam becomes part of the investigations on children with adenotonsillar hypertrophy associated to sleep apnea. Children with adenotonsillar hypertrophy and expressive symptoms are candidates to adenotonsillectomy, either to prevent pulmonary hypertension as complication of chronic obstruction by an enlargement of adenotonsil tissue or to correct such pulmonary alteration on those patients who were already affected by this complication. 1. Blum RH, McGowan FX Jr. Chronic upper airway obstruction and cardiac dysfunction: anatomy, pathophysiology and anesthetic implications. Paediatric Anaesth. 2004;14:75-83. 2. Sie KC, Perkins JA, Clarke WR. Acute right heart failure due to adenotonsillar hypertrophy. Int J Pediatr Otorhinolaryngol. 1997; 41:53-8. 3. Yates DW. Adenotonsillar hypertrophy and cor pulmonale. Br J Anaesth. 1988; 61:355-9. 4. sebusiani BB, Pignatari S, Armínio G, Mekhtarian Neto l, Stamm AEC. Hipertensão pulmonar em pacientes com hipertrofia adenoamigdaliana. Rev Bras Otorrinolaringol. 2003; 69:819-23. 5. Miman MC, Kirazli T, Ozyurek R. Doppler echocardiography in adenotonsillar hypertrophy. Int J Pediatr Otorhinolaryngol. 2000; 54:21-6. 6. Jacobs IN, Teague WG, Bland JW Jr. Pulmonary vascular complications of chronic airway obstruction in children. Arch Otolaryngol Head and Neck Surg. 1997; 123:700-4. 1. Graduation degree. 3rd year Resident Doctor of Otorhinolaryngology at Famema. 2. Master degree student at USP. Resident Doctor of Otorhinolaryngology at Famema. 3. Doctorate student. Head of the ENT Discipline at Famema. 4. Master degree student. Assistant Professor of ENT Discipline at Famema. 5. Post Graduation student. Assistant Professor of ENT Discipline at Famema. This article was submitted to SGP (Publication Management system) of R@IO on March 12th, 2007 and approved on April 22nd, 2007 at 17:16:54.